In the summer of 2010 poet and visual artist Frank Golden left the Auxiliary Workhouse in Ballyvaughan where he had lived for over a decade. He wanted to mark his departure from this stark and still resonant space. He decided to make a film. Preparation of the old Workhouse space was an involved process. Permission had to be obtained from the various landowners, while Archaeologist Maggie Ronayne NUIG was on hand during the surface cleansing of the Workhouse space, to make sure that anything of special interest was carefully preserved. Funding for the project came through Siobhan Mulcachy, Arts Officer, Clare County Council. When the space itself had been fully prepped Golden cast the film, co-opting the talents of seven local actresses, Theresa Leahy, Aja Daly, Marie Flanagan, Judith McGann, Jenny Morton, Tamar Keane, and Dympna Hyland. Central to the process of realising the film was Fergus Tighe, renowned film-maker, whose SEASIDE STORIES was premiered at the Cork Film Festival in 2010. Tighe was principal photographer and editor. The costumes ,which were essential to part two ,were made by Petra Breathnach using images from the Corrofin Workhouse in the Macnamara Photographic collection. As befits a project written and directed by a poet and painter, the film, particularly in part two is richly symbolic. 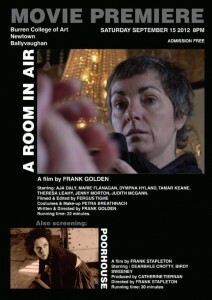 Immediately after the premiere of A ROOM IN AIR there will be a screening of POORHOUSE (30 minutes) a film made by the noted film-maker Frank Stapleton. This extraordinary film starring Dearbhle Crotty and the late Birdy Sweeney is an extremely moving and poignant evocation of the famine period set in a workhouse in Cavan. The script is by Frank Stapleton and Michael Harding. A ROOM IN AIR and POORHOUSE will be screened at the Burren College of Art, Newtown, Ballyvaughan, County Clare, at 8pm, on September 15.